Beginning in the 1970s, the production of rice in Ethiopian agriculture has expanded steadily across the country, with the total land area under rice cultivation rising from about 10,000 ha in 2006, to over 50,000 ha in 2018. Rice is a strategic food security commodity in Ethiopia, and its production has effected significant change in the livelihoods of farmers, and has created job opportunities for a large number of peopleacross different areas of the country. In the Fogera plain, rice plays an important role in abating the problem of food-insecurity of the farming community. Before the introduction of rice, farmers in the Fogera plain were mainly engaged in livestock rearing and small-scale crop production using residual moistures. 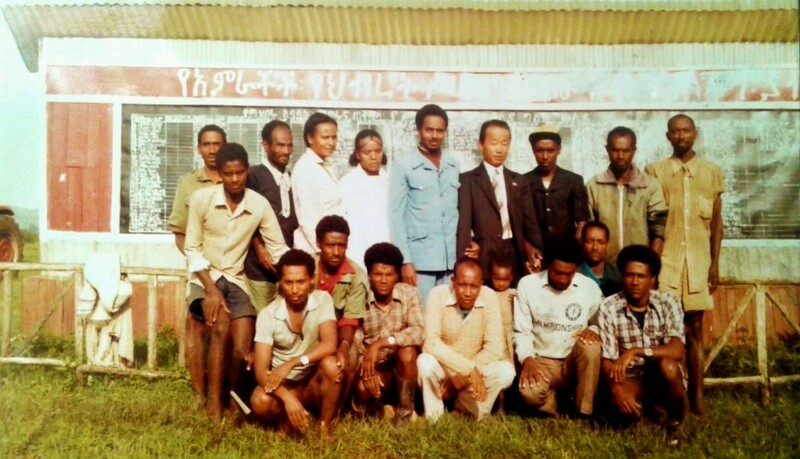 Following a number unsuccessful attempts to introduce rice into the area by different organisations and the government, in July 1984, a team of nine North Korean agriculture experts came to the area with a project entitled “Ethio-Jigna Development Project” – with the objective of establishing and promoting rice and horticultural crops. The project collected and tested a number of different rice varieties, one of which – namedx-Jigna, brought in from North Korea – was found to be best suited to cultivation in the Fogera plain. The project’s researchers then encouraged Fogera farmers to begin rice production with the newly adapted rice variety, which remains in production in the area today. The introduction of x-Jigna to the region has transformed the lives of the farmers, from the poorest to the wealthiest farmers in the country with a production surplus. State emphasis on rice research in Ethiopia began in 1985/6 with the establishment of Pawe and Abobo research centres during the then massive resettlement programme. In the early 1980s,with the technical support of North Korean experts, rice research was initiated in Jigna (Deraworeda) and Shaga (Fogera woreda) cooperatives. Following the dissolution of farmers’ cooperatives in 1991,Getachew Afework – an agronomy expert in the South Gondar Department of Agriculture –collected rice seeds for further promotion in the Fogera plain. He obtained seeds from farmers in Jignakebele, which is was why it was named as x-Jigna. After multiplication, the seeds were then distributed to farmers for demonstration and research purposes. Following his efforts and the government’s, Adet Agricultural Research Centre (AARC) became involved in rice research and generated rice varieties and management technologies, coordinating national rice research until the establishment of Fogera National Rice Research and Training centre (FNRRTC)in 2013.FNRRTC is conducting research on rice in Fogera palin. It is also having the role of coordinating the national rice research activity in Ethiopia. The national average for rice productivity is about 2.8 ton/ha, which is low compared to the world average. The lack of a formal rice seed system hampers the expansion of rice production in Ethiopia. The demand for improved rice varieties, certified seeds and crop management technologies from different stakeholders is increasing,indicating the need to establish a strong research and development system in the country. It is estimated that there is about 30 million ha of unused land in Ethiopia that is suitable for rice production. Despite this potential, importation of rice into the country is increasing in order to meet rising demand. To bolster the country’s rice research, the Ethiopian Institute of Agricultural Research has developed a 15-year “Rice Research Strategy,” which was initiated in 2017. Fogera National Rice Research and Training Centre(NRRTC) works in close collaboration with different national and international stakeholders, including Bureaus of Agriculture, Federal and Regional Research Centres, Universities, etc. Currently, two bilateral NGOs are working on rice value chain development in Amhara region, Ethiopia. The NGO AgroBIG (Ethio-Finland Agribusiness Induced Economic Growth)has been working in the area since 2015, and supports rice sector development in Fogera using a value chain approach, implementing interventions with farmers, processors and marketers. The other NGO is MEDA (Menonite Development Association), financed by Canada, which also works in rice value chain development. Both of the NGOs are working with FNRRTC to support the promotion of technology, seed production, processing and marketing of rice. Any best fit rice technology is usually demonstrated, popularised, and pre-scaled in major rice growing regions. Improved rice varieties, along with improved management practices, are demonstrated to farmers by the research centres. Selection of demonstration plots and participating farmers is usually done with the joint effort of the research centre and local Agricultural Offices. Current farming practices are demonstrated alongside the improved practices, allowing farmers to evaluate the new practices by direct comparison; once a demand has been generated, the research centres multiply and distribute the new seed varieties to farmers. Since there are no companies in Ethiopia involved in production of certified rice seed, the research centre, in collaboration with other partners (MEDA and AgroBIG), has established two community-based certified rice seed producing cooperatives, one for upland varieties and the other for the lowland varieties. The cooperatives are able to receive technical assistance and basic seeds supply from the affiliated research centre. The governmental seed quality control and assurance office then inspect the seed production process and certify the seed produced. To date, 35 improved rice varieties have been released for the three rice ecosystems (15 for rainfed upland, 11 for rainfed lowland and 9 for irrigated). The initiation and expansion of upland rice production in Ethiopia correlates strongly with the implementation of research into the commodity. The varieties tested and disseminated by the research organisations are bringing farmers higher yields (Table 1). The rice research centres have been able to generate information about rice disease, insect pests and weeds distribution and prevalence. Based on this information, a number of location-specific agronomic and crop protection recommendations are given, including fertiliser rate and application, seed rates and planting methods, cropping systems with respect to crop rotation, relay intercropping and double cropping with other cereal and vegetable crops. Moreover, some mechanical implements like row weeders, harvesters and threshers have been evaluated.